We're lucky to have artist Dolan Gemain in our Flea vendor family, a nationally-recognized mixed media artist with a style that infuses a folk art tradition with a contemporary, urban style. Geiman continuously amazes with vibrant and unique collages, paintings, silkscreens, and 3-D assemblages, all produced with vintage papers, salvaged wood scrap metal, and other found materials in his "home base" studio located just south of Denver. continue to strive to be cutting edge in our ideas. Now, we have a little bit of a cleaner edge and a larger market, but the honesty of the materials is still central to our designs. “fight me” on the front with pictures of little cats faces on them. I used the money to buy cigarettes and lunches at a local boxcar diner out near the feed lot. I could sit at the counter there and smoke and talk to the 70 year old waitresses while the rain outside made the sidewalk smell like worms. I loved it. / And mention all the things I'll loose / That really have no value…. in the end she will surely know / I wasn't born to follow." makers. Now, we continue to evolve and move on to bigger and better things, but we still make and sell these constructions on our site and they still have the same cool and interesting found materials as they did from day one. 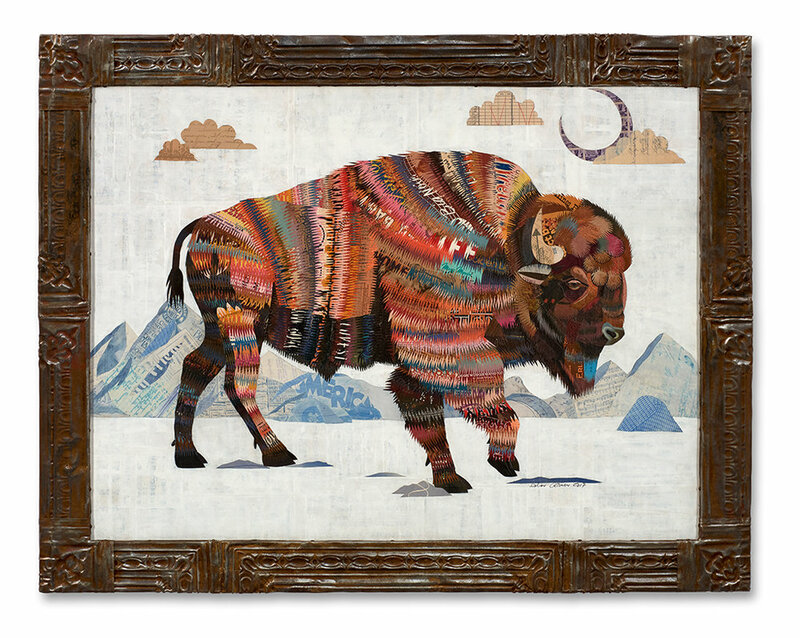 The Bison with Mountains art print to add a little color and nature to our walls! Dolan and Ali Marie Geiman. For the first few years in business we lived in abandoned spaces and started a clothing line where we recycled and sewed clothes we found in old houses and dumpsters.